Christmas is just a few weeks away. The holiday season is always a busy and packed time for online stores and businesses. It is the time to bring out your best promotional offers and enjoy a nice boost in sales before the end of the year. The one main challenge of doing a Christmas promotion is letting customers know the cut-off time. While customers can still shop throughout the holiday season, you may not be able to fulfil their orders as quickly due to the courier services not operating, so it is important to make last postage dates clear on your website. Always place the information on your main page. It is also a good idea to mention the last postage dates of the different courier services you offer to customers in the checkout page, or as a warning under the shipping option. This way, you don’t have to spend the holiday dealing with customer complaints and similar issues. By making these dates clear, you’re taking an active step towards ensuring customer satisfaction and maintaining a high level of user experience. Let’s not forget that different courier services have different last postage dates. Mentioning them on the site will help customers choose the right shipping method and get a clear estimate of when their purchases will arrive. Running an online business is a full-time job, but that doesn’t mean you can’t give yourself a holiday. Christmas and the New Year are the perfect times to take that holiday you’ve wanted for so long. You can get together with the family and spend the holiday season not worrying about your online business at all. A lot of online stores and businesses take it a step further and stop processing customer orders altogether due to the courier services not operating during the holiday season. This is an approach worth considering nonetheless. 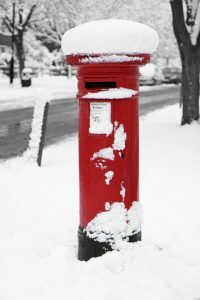 While some customers may feel disappointed about your decision to delay order processing until a couple of days after New Year, they will quickly understand the circumstance when you also announce the last postage dates on your website. Simply make the dates clear and stick to them. As mentioned earlier, providing clear and accurate information to customers and visitors is simply a way to maintain a high level of user experience. User experience is more important than ever. Search engines now take user experience as one of the most important metrics when ranking websites. Users will highly appreciate the fact that you’re being clear and transparent with them, too. On top of that, announcing last postage dates clearly will also affect your credibility. The best online stores and websites will always display this information front and centre to maintain credibility and users’ trust. As you can see, making last postage dates for Christmas clear on your website is important indeed. If you haven’t already, now is the perfect time to list the dates on your pages.